CSR intake system for OE standard Air Mas meter consists of a AEM Dry Flow air filter, the CSR heat deflector shield complete with all the brackets and fittings with the option of our Courtenay Sport High flow inlet hose and adaptor. CSR uprated intake system featuring our own 80mm high flow trumpeted air mas meter housing. This housing has proven itself beyond compare in our Astra J VXR tuning program so we have introduced this in a package to suit the Corsa E VXR with exceptional results. The CSR housing is shaped to get the most air we can across the whole of the air mass meter without the need for the restriction of an inbuilt air straightener, to achieve the best flow possible. This combined with a large diameter AEM Dry Flow air filter give a massive increase in air flow potential. The kit comes complete with a custom-made CSR heat deflector shield along with all the brackets and fittings and our own high flow reinforced inlet pipe down to the turbo. Note: All cars fitted with the 80mm induction systems will need to have the cars ECU re-calibrated to scale the air mass meter correctly to take advantage of its larger size and to stop the EML coming on for to exceeding the 70mm air flow limits. Does exactly what it says on the tin. A guide to EBC brake pad compounds and their uses. Click on the image below to open up a PDF file (you will need a PDF reader such as Adobe or similar). Another Astra J VXR in for front pipe fitting (shown centre front), followed by mapping and rolling road set up. After mapping and set up, on 97RON fuel, this particular car achieved 324bhp and 357lb ft torque. We recently had the job of improving the stopping and handling on an Astra H.
This included supplying and fitting a D2 6 Pot 356mm front brake kit, complemented by a rear 292mm brake upgrade with vented rear 8G discs and new calipers. Additionally a Premium Suspension package was also supplied and fitted: B8 dampers and DAP Road spec springs along with poly bushed Whiteline front wishbones, Powerflex poly rear beam bushes and a Whiteline rear anti roll bar. 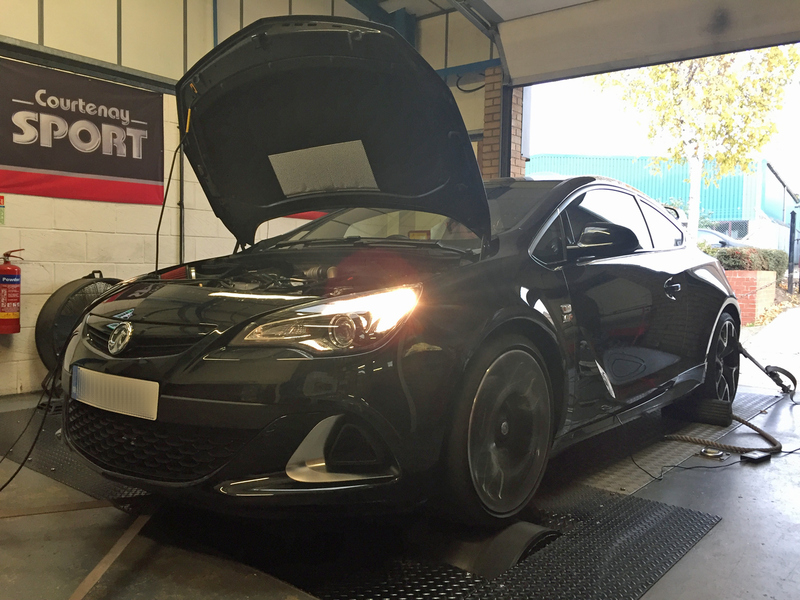 Another Astra J VXR in for our increasingly popular Stage 1+ tuning package, comprising of front pipe fitting, ecu remap and rolling road set up. This car made a respectable 320bhp and 339 lb ft torque. This Corsa E VXR came to us to have a full turbo back 3″ exhaust fitted, followed by map optimisation to suit the exhaust and full rolling road set up. Once set up the results were an impressive 241bhp and 244 lb ft torque. We also carried out our own unique hardware fix and software recalibration to the air flow meter to allow it to read and fuel correctly above 222bhp, where it is known that the standard air flow meter maxes out. We also have in development the CSR MaxAir Intake System for Corsa E VXR, which will feature an enlarged airflow meter housing and large AEM Dryflow cone filter. We recently had this lovely Astra H 888 CDTi (Z19DTH engine with M32 gearbox) in for a lighter single mass flywheel (removing the dual mass flywheel) and sprung clutch assembly due to slight clutch slip on the factory clutch. At the same time we also overhauled the gearbox fitting new bearings throughout and the later end case, which features larger diameter end case bearings and additional oil galleries in the end case for better end case bearing lubrication. This Insignia VXR came in to have our high flow front pipe (which removes the pre-cat or first cat) and Euro V compliant high flow sports cat fitted. Once this was done in the workshop, the car was into the dyno cell for mapping and full rolling road set up. A change to the more common Astra J VXRs we see in Arden Blue, this time in the much less seen but equally stunning Power Red. The car had already been fitted with a full 3″ Piper turbo back exhaust system and an Airtec cooler and induction kit when it arrived with us and when benchmarked produced 300bhp and 348 lb ft torque when benchmarked, although with a noticeably bouncing boost curve between 3-4,000 rpm due to the factory software, which was reflected inthe power and torque curves. Once mapping was completed the results were a very respectable 340 bhp and 381 lb ft, after we had fitted our own air flow meter inlet housing and AEM dryflow cone filter which allowed the car to produce an extra 3 bhp and 10 lb ft torque over the original induction kit that had been fitted on the car. Our free flowing air flow meter housing was specifically developed for the Astra J VXR on our rolling road and features a built in air straightener so correct air mass values which are relayed to the ECU, and able to help this car reach higher numbers. Another Astra J VXR in for mapping, in the ever popular blue, this time from another repeat customer who was more than pleased with work we carried out to his previous car a Vectra VXR. Already fitted with an induction kit and our 3″ pre-cat removal pipe the car came in for mapping and full rolling road set up. The final figures were up from 280bhp and 324 lb ft to 325 bhp and 365 lb ft torque. This car had previously been in for a full engine rebuild with forged pistons and steel rods, strengthening the factory Z20LET engine and was running a K04 Z20LEH VXR turbocharger, Milltek 63.5mm exhaust system, Pro Alloy chargecooler and VXR injectors. It returned to us to have some further enhancements which included a full 76mm Tullett exhaust system, a K06 turbocharger, Courtenay Klasen inlet manifold, uprated clutch and 80mm air flow meter. After mapping and a full rolling road set up it is now producing 334bhp and 340lb ft torque, and is very at home on the track where it spends most of its ‘working’ life. We are seeeing an ever increasing number of Astra J VXRs in for remapping and rolling road set up. As with Astra H VXR, blue seems to be a popular colour. This car came to us with a pre cat removal pipe and Evoms kit already fitting. After mapping and rolling road set up the numbers were 333bhp and 376lb ft, which are within ther expected range. Early in testing the Astra J VXR it was discovered that the original factory airbox simply would not cut it even with the usual modifications. Porting it simply could not flow the required air, so some kind of induction system was required. accelerated through the center of the MAF which in effect meant the engine was receiving less air than the mass meter was reading and reporting to the ECU. The target was therefore to create a trumpet with as long and smooth a progression of taper as space would allow in order to slowly turn and progress the air so smoothly that an air straightener was not even required. After testing a number of prototypes we achieved this goal. Now we had to produce this. We looked at aluminium, however this was deemed too heavy with far too much wastage having the units moulded would make the product far too expensive so we turned to the relatively new dark art of plastic printing. We are able to make both the trumpet and the housing in one piece making it very clean looking on the outside and smoother for flow on the inside with a weight saving over an alloy version of a fraction under ½ a kilo. Not massive agreed but it all counts. Attached to the new MAF housing we use a massive high flow AEM dry filter for very efficient filtration and breathing. This package is then housed in a powder coated heatshield assembly with the Courtenay Sport logo laser cut out of it. With the standard inlet air pipe just over 13bhp at peak power and with an enlarged silicone induction pipe 15 BHP. Also when compared to a parallel housing induction version it makes an extra 3 BHP at peak and a further 15 BHP from 5650 RPM! The MaxAir induction system is compatible for both mapped and standard cars. 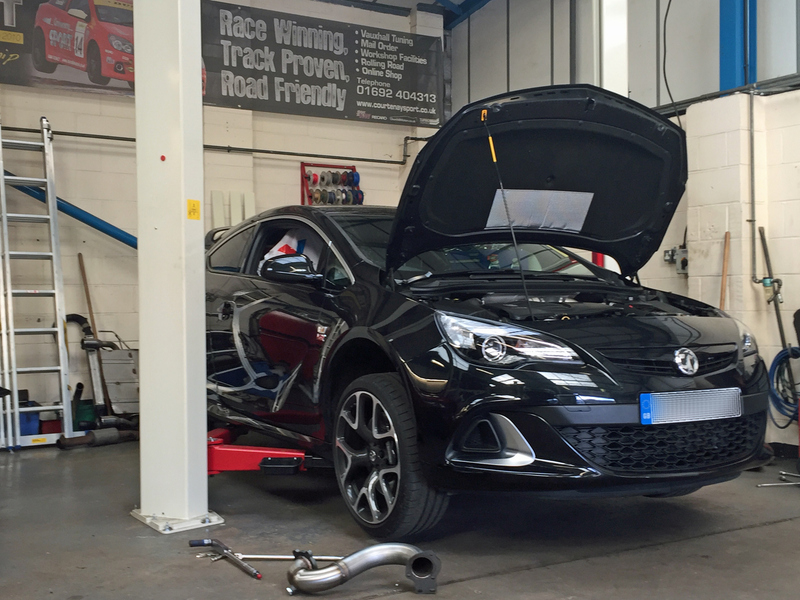 Another Astra J VXR in for a Stage1+ tuning package, which is proving to be a very popular option for many owners. The first stage is to benchmarck the power of the standard car. It had already had a generic flash map installed via a well known hand held tuning box, so we first ran the car with the generic map installed, then using the hand held unit returned the car to factory standard software and ran it again. With the generic flash map loaded the car produced 287bhp and when returned to the standard map and run again the car made 281bhp. It was then round onto the ramp so the pre cat removal pipe could be fitted, removing the restrictive factory pre cat. Once the 76mm straight through pre cat removal pipe had been fitted it was back onto the rolling road for mapping and datalogging whilst the map is optimised on the rolling road, resulting in 328bhp and 373 lb ft torque. This Meriva VXR had visited us before for a remap, and came back to have some further improvements carried out. We removed the pre-cat and fitted a straight through pre-cat replacement pipe (downpipe) to remove the restrictive first cat, fitted a set of NGK iridium plugs and a high flow Courtenay Sport panel filter. Then it was back onto the rolling road for map optimisation, datalogging and rolling road set up. The results were 216bhp and 243 lb ft torque. Another returning customer coming back to us this time with his 7,000 mile Insignia VXR for mapping, having previously has his Vectra VXR mapped by us. Latest spec and an otherwise standard car, and a little under a year old we carried out the mapping, map optimisation, datalogging and full rolling road set up achieving 332 bhp and 380 lb ft torque, it will loosen up given a few more miles on its belt. Stage 3 is the final stage upgrade using the standard factory K04 Turbo. This package consists of pre-cat deletion, replacing the OE factory front pipe and first cat first cat with our free flowing 3” cat-less front pipe (also used in our stage 1+ package). In the quest for further power we then turn to the next restriction which is the case of the Astra J VXR is the original equipment air intake/air box. We completely remove this and replace it with a huge free flowing AEM non oiled Dry Flow Filter. This is mounted to a free flowing air flow meter housing which features a built in air straightener so correct air mass values are relayed to the ECU, finally this assembly sits within a heat deflector shield. This particular car has also had our upgrade silicone inlet hose fitted. With the Stage 3 package we are looking to fully optimise everything around the turbo to fully maximise efficiency, so a huge Pro Alloy/Courtenay full height intercooler is installed complete with large bore pipe work and hoses, which whilst keeping the inlet air temperatures very cold also optimises the flow from the turbo through to the inlet manifold. The intercooler and pipework on the above car have been finish in stealth black finish. Next a 3” free flowing cat section is fitted to compliment the high flow front pipe. With these parts installed the car is remapped on our rolling road optimising our Exclusive Courtenay Sport software to take full advantage to achieve maximum gains from these components. Final power and torque figures are a very healthy 342bhp and 384 lb ft.
As an option to enhance the soundtrack, this car has also had our 3″ single sliencer cat back system fitted.